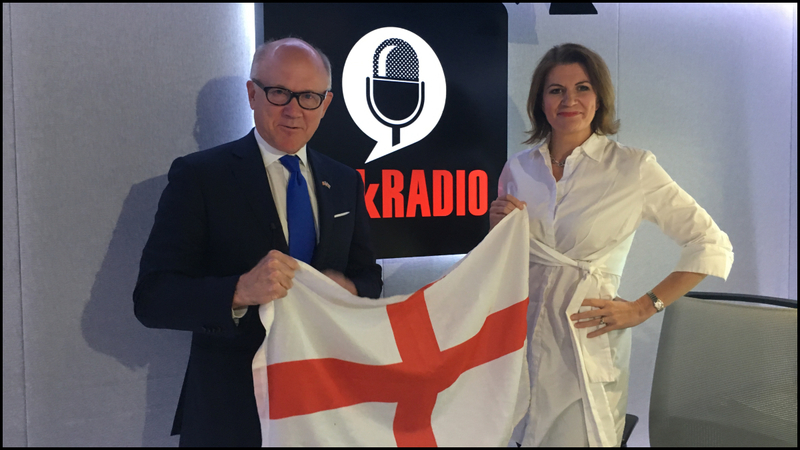 With weeks to go until Donald Trump’s official visit to the UK, the US Ambassador Woody Johnson told talkRADIO that he was unbothered by the planned protests. Trump is set to land in the UK late on July 12, before meeting with Theresa May and the Queen, and visiting his golf course in Turnberry, Scotland. Johnson joined Julia Hartley-Brewer on the breakfast show and remained diplomatic despite being grilled on topics from trade tariffs to migrant families being separated. “I think it’s extremely important that the president of the USA comes to Britain and shows his report to the country. No matter what happens with Brexit, our relationship is stronger than ever. Trump is scheduled to meet the Queen at Windsor Castle, but he won’t be afforded a full state visit. “He’s talked about being president for years, since his thirties. I think he saw the country going in a direction… that was incapable of handling issues. “He thought, ‘Being president I can address those things, I have no fear. If I’m a one-termer, so what, I’ll go in and I’ll make a difference’. 1988 is the first time Trump was reported to be considering running for president - he was 42, so it’s likely he had been considering it for some time. He also ran for president for the Reform Party in 2000, but pulled out of the race early. “I don’t think [the protests will have an effect] and I don’t think protests were ever a factor in him coming or not. “He’s comfortable in where he wants to take [the US]. 53,000 have clicked ‘attending’ on a Facebook page called ‘Protest Trump’s Visit’, with another 151,000 listed as ‘interested. The organisers behind the Women’s March are also holding a protest, with a slightly more modest 1,000 attendees. “I think together, this country and the US are much stronger and much more prosperous. Looking at the success the president’s had in the US with the economy and defence, the economy’s growing and consumer confidence is at an all-time high. It’s something he’s done so rapidly. Under Trump, the economy has been growing, but growth has slowed since the third quarter of 2017, where it grew 3.2%. In the fourth quarter it grew 2.9%, then 2.2% in the first quarter of 2018. “The aluminium and steel is an integral part of industry in the US and he thinks it’s important in the time of war, so that’s why he put those tariffs on. He wants to work out a bilateral agreement when Brexit takes place. On June 1, Trump introduced a 25% tariff on imports of steel and a 10% tariff on aluminium on the EU, Canada and Mexico. The EU has since retaliated with 25% tariffs on Harley-Davidson motorbikes, Levi’s jeans, and bourbon whiskey. “The issue of migrant children is the result of many years of Congress not addressing the issue in a compassionate way. He’s signed an executive order to reunite them, but it won’t be solved until we have immigration reform which is what he’s working toward.